Jonny Gould's Soccermongery: Baggies looking for a sponsor - any sponsor! 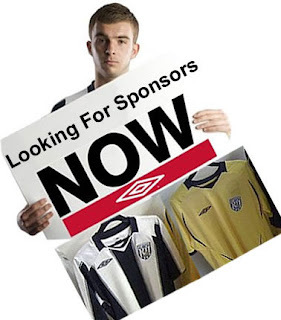 Baggies looking for a sponsor - any sponsor! I was interested to read about West Bromwich Albion's efforts to sell their shirt sponsorship on a match by match basis. Outside the Big 4, the football sponsorship market for club deals has collapsed. Clubs at all levels are finding it harder and harder to maintain even their current deals and price levels - and next to impossible to find new partners ready and willing to pay what was previously seen as the "going rate". The only sector that seems to be active in this market is Betting Companies, on and off-line, and as I'm sure you all know, they're always looking for bargains, they smell blood in the water and won't pay top dollar. I'm aware of what some of the clubs, particularly those outside the Premier League have been getting for their shirts and believe me, the figures do not make happy reading. Aston Villa, Sheffield Wednesday and I think a couple of others made the decision to donate their shirt to local charities - an excellent move but who knows how they would have responded to a good offer from a brand? As for selling the shirt on a match to match basis, this might offer a decent opportunity on a tactical basis to a brand (like a TV match) as has been the case for non-league teams in the FA Cup (Northwich Victoria and others) but leaving aside the inconvenience and how the fans will react to seeing their shirt as no more than a type of rotating billboard I think it smacks of desperation. A few years ago, Crystal Palace, who were in terrible financial trouble made a similar offer and my company sponsored their shirts for a one off game at QPR. It was an excellent buy for us and was seen as providing some extra cash for a club on their uppers but I don't think it does much for a club like Albion, who are perceived as ambitious and challenging for promotion. I think that West Brom are in talks with TAMPAX about a sponsorship deal.........and more!